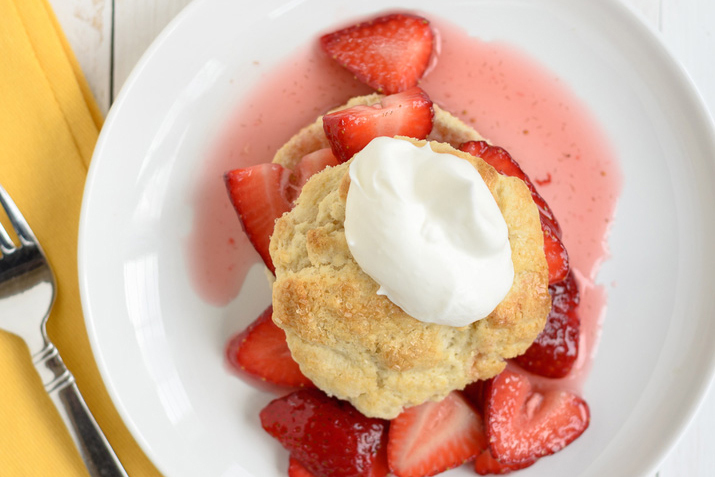 There's good reason strawberry shortcake is a classic dessert. It's simple, yet amazingly delightful. Clean and slice fresh strawberries & set aside. Grab two stainless steel bowls, one slightly larger than the other. Add crushed ice and a little water to the larger bowl to make an ice bath. In the smaller bowl, add cream, vanilla and 1/4 powdered sugar. Place the smaller bowl into the water bath and, with a whisk, beat the whipping cream until it makes stiff peaks. Spoon fresh Chantilly cream on sliced angel food cake or shortcake, and then add fresh sliced strawberries. Garnish with chocolate chips if desired.